Dogs are energetic creatures. Sure, they might spend most of the day chilling on the couch until you get home, but then all they want is your endless attention, willing to play fetch until your arms fall off, only taking the occasional break to catch their breath. You also may have experienced one of their stranger bursts of energy, where out of nowhere they decide to full-on bolt through the house like an Olympic sprinter. Like they’re just checking in to make sure their top speed is still in functioning order. It might not happen every day, but it happens. Why do they do that? Is it normal? We can always tell when my dog, Jaws, is moments away from one of these energy surges by the crazed look he gets in his eye. He then usually lunges downward with his front paws splayed out before him and his tail waving chaotically in the air behind him. Sometimes, he sprints around so recklessly that he runs into doorframes and walls — enough for us to worry he might hurt himself. Yet he never has, and to be honest, it looks like he’s having the time of his life. According to Animal Planet‘s pet expert Andrea Arden, not only is this behavior normal, but it has a name: frenetic random activity periods. “These bursts of activity, where the dog runs around, racing from one end of a room to the other, sometimes spinning in circles and with a bit of a wild glint in their eye, usually end in a contented and exhausted flop onto the ground and are fueled by the loads of energy that most puppies and many adult dogs have,” Arden explains on her website. Arden does caution that even though FRAPs — which are called the “zoomies” colloquially — are normal, they could be indicative of boredom or insufficient stimulation. 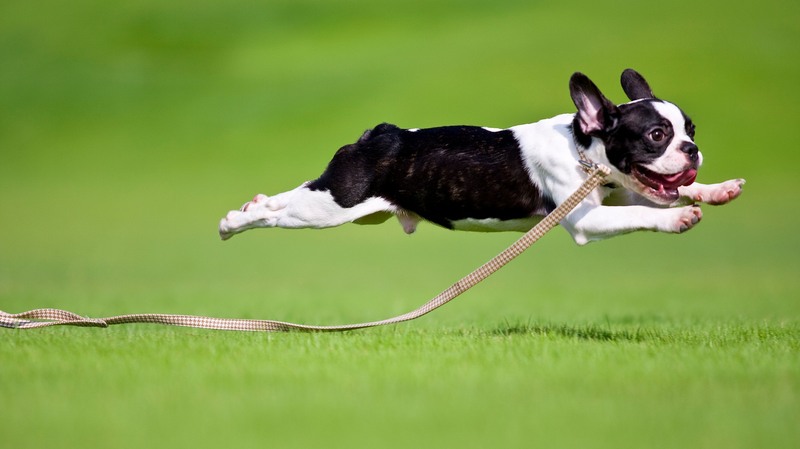 If your pup seems to be zooming all over the place at regular intervals, you probably need to find a dog park so your pooch can burn that energy off. In fact, it was reportedly one of Wilson’s clients who coined the term frenetic random activity periods, and Wilson liked it so much she stuck with it. Over the years, she has developed solid pointers for pet owners who are curious about this canine phenomenon. In addition to ensuring you give your dog ample exercise, Wilson says you shouldn’t chase your dog during FRAPs and — if at all possible — you shouldn’t laugh at them either. Why, pray tell? Well, because doing so may give your pup the impression you’re praising them. Because pups love to please, they will want to continue to do anything you praise them for. Unless you’re ready to watch your canine cutie careen all over the house and yard on the regular, take it easy with the kudos. Since many dogs get the zoomies on a relatively reliable schedule, you can anticipate them coming and take your dog for a walk outside or set them up somewhere to run during those times of day. You can also stock your pup up with chew toys and other things that might thwart excessive energy. Of course, if you’re anything like me, you might just kick back and enjoy the show, and that’s OK too. Your pup has to get the energy out regardless, and you have to admit, FRAPs can be pretty doggone cute.